The order to manufacture CRD46 comes again from Spain and more specifically from Madrid. It was going to be the second Harley Davidson that fell into our hands, although in this case it was going to be an XR1200, a very powerful but heavy and bulky bike. These characteristics marked us the guidelines to follow for the customization of the motorcycle. The motto of “less is more”, which had been so successful in the past, would have to be followed very closely in order to correct these shortcomings and make a proper Cafe Racer Harley Davidson. As you can imagine the first thing that we decided to modify was the sub chassis, we changed the heavyset tail of the XR by a minimalist custom made by hand by our team, something that also allowed to put a leather seat that was in the line of the design that had marked the fuel tank made by our friends Pablo and Carlos Delgado from Valtorón. The next thing we changed were the shocks, something necessary on the other hand to be able to adjust them to the new height of the motorcycle. The originals were replaced by a pair of Öhlins socks that also contributed to mark the new sporting character that was taking the motorcycle. You can read all the detailed changes of this Cafe Racer Harley Davidson in this article from Bike Exif. 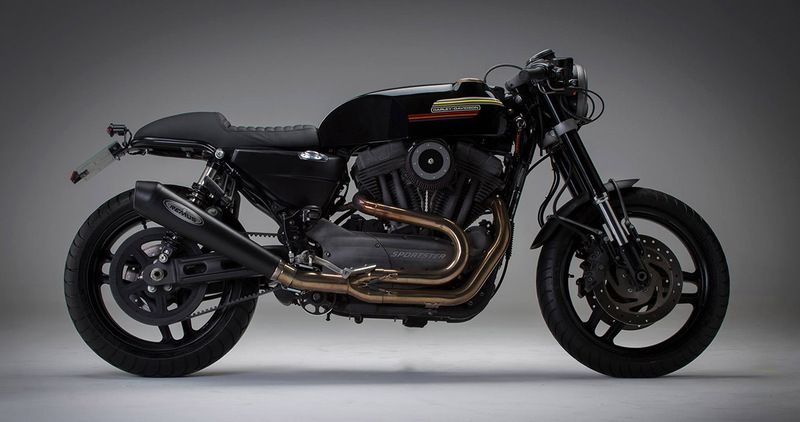 Follow this link if you want to watch other Harley Davidson commissioned by Cafe Racer Dreams.